I first caught up with her in 1987. The ‘Shed’ was the way down below and also contained a toilet, which emptied into the mud below the yacht, nice!. 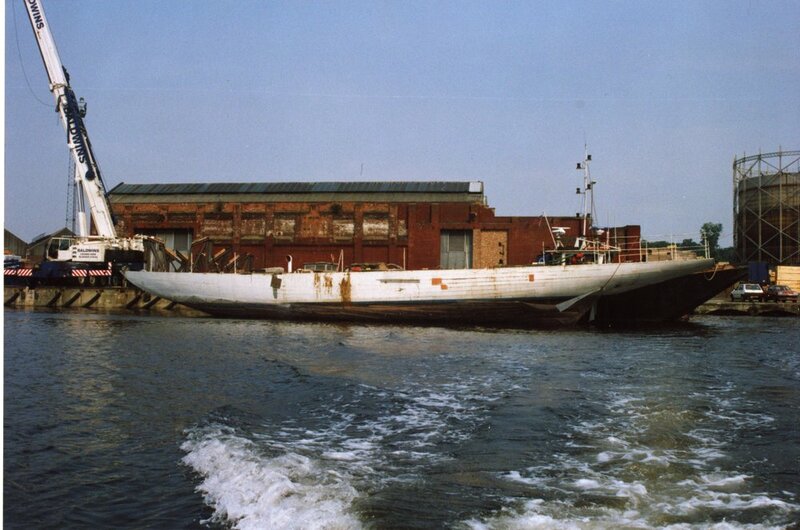 The Salvage operation was directed by Harry Spencer, using his tug, Hoffland, and a Thames lighter. 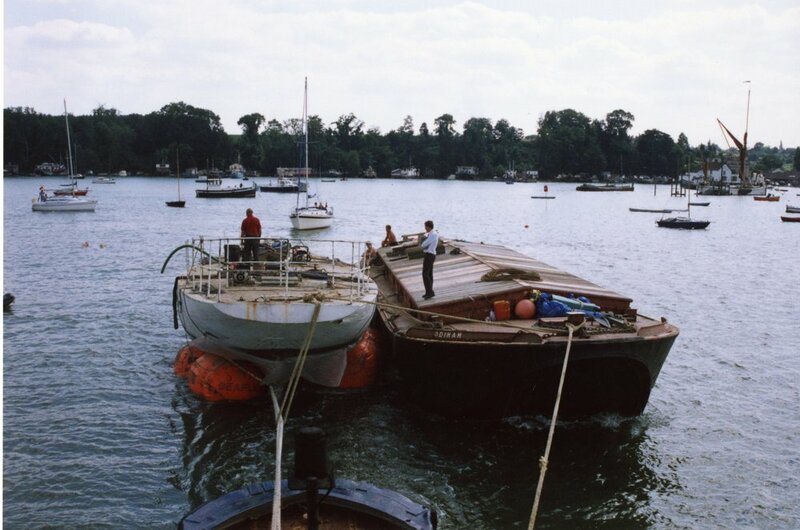 We loaded up all the necessary gear in Hamble, including the lifting cradle into the lighter and sent that up by sea, towed by the Hoffland. 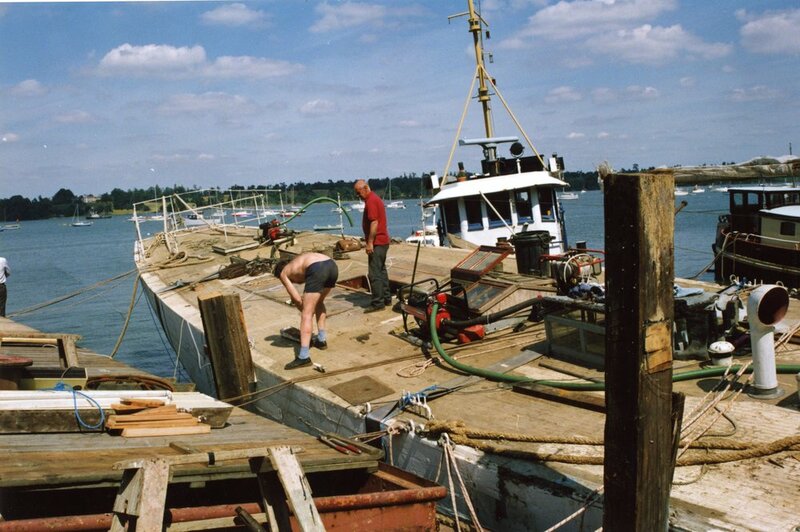 With Mariquita’s greatest draft well aft only the equinox tides lifted her entirely clear of the mud, so, as it was August it was necessary to dig under the aft end of the hull and place two airbags under each side to lift the aft end clear. The plan was to lift the yacht at high tide the day after the bags were placed. With the bags fitted a low tide and inflated we all went off until the next day. The question in everyone mind was were the bags high enough, too high etc. At around 02.00 in the morning Harry banged on my door and we went down to the yacht, at high tide. The bags were too low, the yacht wasn’t stable, she rolled around far too much as we walked around the deck. We carefully eased the lines holding the airbags until she became stable and then crept away to await the next day. The next morning as the tide rose we cut off one set of piles and then bought the lighter alongside Mariquita and secured the two vessels together to give more piece of mind. the tide from the night before- would she come free of the mud? With the Hoffland moved offshore I went out in the tender and rang a tow line back to the yacht, which, when secured and went tight, flipped me out of the tender into the river, with a large roll of cash of my pocket, I am pleased to report that only the outside notes got wet. With the tow line attached, the tug gently started pulling at the yacht – Nothing. A few more revs – Still nothing. A burst of full power did it, Mariquita gently slid out of her berth of forty years. With the yacht safely afloat we boarded her and gently eased the valves on the airbags thus lowering the stern somewhat closer to the design waterline. Off we went slowly moving up the Orwell. With the iconic bridge behind us we slowly approached the wet dock in Ipswich and locked in. Mariquita sits quietly without any air bags, afloat for the first time since the nineteen fifties awaiting the next phase of the operation. The cradle which had come up with us in the lighter was assembled on the dockside and swung over the water and slid gently under Mariquita. 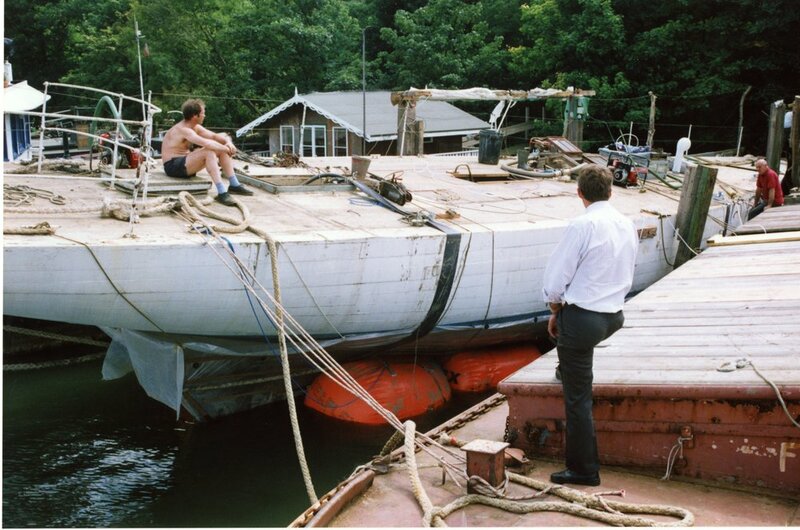 The cradle and yacht are picked up and the lighter warped into position under the yacht. Time for a glass of bubbly before starting the job of making the lighter/Mariquita joint watertight with a few dozen sheets of sterling board.